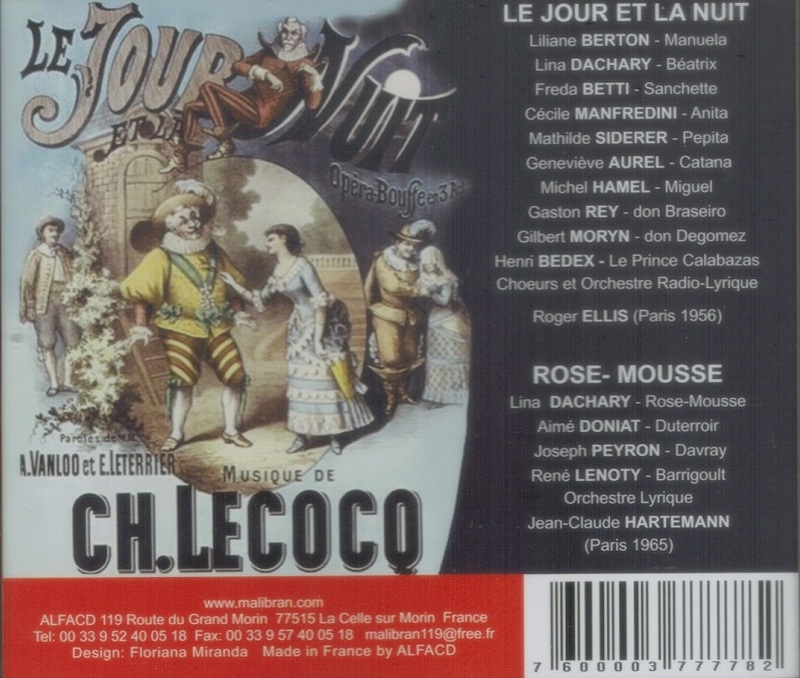 "Alexandre Charles Lecocq was a French musical composer, active during the latter half of the 19th Century. He studied under FranÃ§ois Bazin, FranÃ§ois Benoist, and Fromental HalÃ©vy, winning the first prize for harmony at the Conservatoire in 1850, and the second prize for fugue in 1852. He first gained notice by sharing with Georges Bizet the first prize for an operetta in a competition instituted by Jacques Offenbach. His opÃ©ra comique, LE DOCTEUR MIRACLE, was performed at the ThÃ©Ã¡tre des Bouffes Parisiens in 1857. After that he wrote constantly for theatres, but produced nothing especially successful until FLEUR-DE-THÃ‰ (1868), which ran for more than a hundred nights. LES CENT VIERGES (1872) was also favorably received. All his previous successes were cast into the shade by LA FILLE DE MADAME ANGOT (Brussels, 1872), which in Paris in 1873 was performed for more than 400 nights consecutively, and which has since gained and retained enormous popularity. 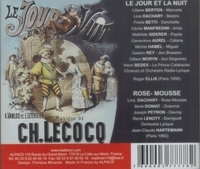 After 1873, Lecocq produced a large number of operettas. Camille Saint-SaÃ«ns was a friend of Lecocq's, and never ceased to admire the latter's music. 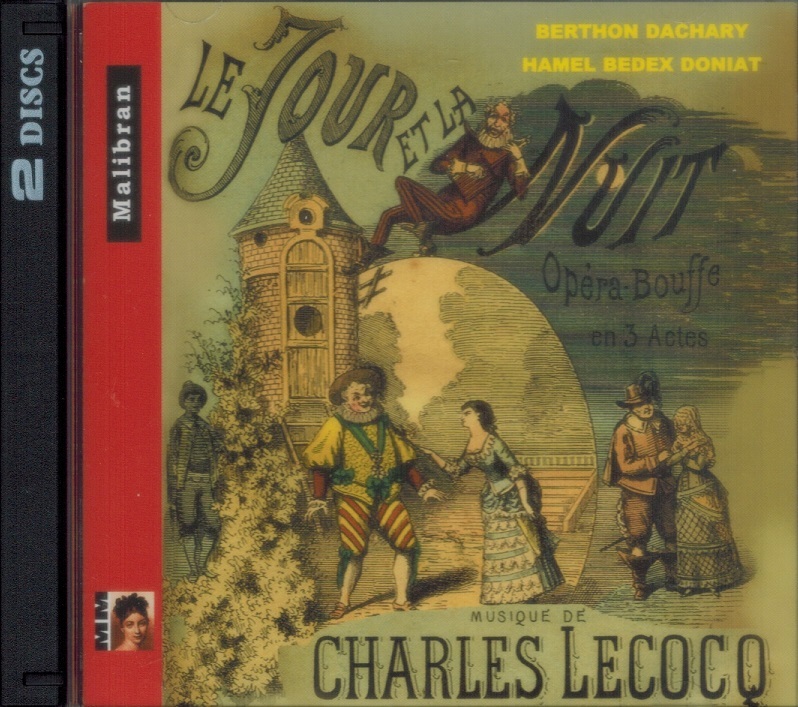 Lecocq 's LE JOUR ET LA NUIT is especially enchanting and delightful. When AimÃ© Doniat left the Conservatoire (with a first Bassoon Prize), he was engaged in an orchestra. After only three months, and having made the acquaintance of a small traveling troupe, he was hired to accompany it during its tour in Algeria, and then joined with it in Marseilles. From there, he joined the National Radio. The Radio Orchestra and its chorus returned to Paris in March 1943. Doniat became a soloist and was frequently called upon to replace singers in lyrical performances on various Parisian and provincial scenes. As early as 1944, he decided to take a big risk and became soloist for the various radio programs: operettas, comic operas. His new activity also led him to participate in several casts in various operettas performed in concert halls. Doniat worked extensively for Véga, Decca, RCA, Erato, Saphir, Le Chant du Monde, Musidisc, EMI, PathÃ©, Vox, Visadisc, Philips and recorded over 160 LPs. After the disappearance of the LP, more than fifty reissues were released before the end of the twentieth century, in discs, cassettes and compact discs. He won 10 Grands Prix du Disque. He sang Delmet, Botrel, Scotto, and many others. He resurrected medieval songs and French provinces. He wrote lyrics on ancient mÃ©lodies he loved to discover. He translated into French the booklets of a few German-language operettas. Beside his recordings, AimÃ© Doniat remained one of the essential pillars of the Lyric Service of the RTF, then of the ORTF. For many years, before the taste of the French public for classic lyric art faded, he recorded a dozen operettas a month (which left very little time for rehearsals) with Jany Sylvaire and Lina Dachary, his most faithful female partners, and under the direction in particular of Jules Gressier and Marcel Cariven. The number of these recordings was reduced to two per month during the last ten years of its life, as broadcasting programs had shrunk considerably on national radio. They were heard more on the Belgian and Swiss radio channels. Doniat taught singing for a long time on a private basis, for a few selected pupils, ultimately teaching at Versailles."